Shivay:Tell me Prem.What did I see now? Shivay:Don’t try to hide anything Prem.I saw everything.I have met Simar at business meetings.But I thought she is just your colleague.But now…what is your relationship with Simar? Prem’s tears rolled down his cheeks. Prem:Simar and I were best friends too.But unknowingly I fell in love with her.But there is not affair between us like you think.Before I could even confess my love to Simar my father fixed my marriage with his best friend’s daughter. Shivay:Why did you agree to that if you love Simar? Prem:Since childhood I have only obeyed my father.I can’t disobey him.And I did’nt want my father’s long friendship to be destroyed because of me.Also I was not aware of Simar’s feelings for me. Shivay:But now you are aware of Simar’s feelings for you.She also loves you.That’s why she fasted for you on Karwachauth.Why don’t you confess your love to Simar now? Prem was upset:But now it’s too late.I can’t cheat Soumya.I can’t hurt her. Shivay:You fool!If you unite with Simar,Soumya will not be hurt,but happy.This is what she also wants. Prem was stunned:What do you mean? Shivay:Even Soumya agreed to marry you only for her father.She loves my brother Rudra. Raghu was in complete shock. Raghu thought:Why love is so complicated?Rudra loves Soumya?Then what about Rudra and Bhavya? Soumya and Rudra were sitting together with Rudra’s family. Soumya:The wedding is near.I doubt if in the last moment papa will change his mind. Rudra:Don’t worry Soumya.I am a lover who came to take my bride and I will do that.I am still confident that your father will hand over you to me. Shivay came:Your wish will be fulfilled. They both looked at Shivay.Then they saw Prem coming from behind. Rudra and Soumya were nervous to face Prem. Soumya whispered:Guess Prem saw us together. Rudra:One day he had to know about us.But like this…it was not at all good. Soumya:Prem…I am sorry.Please don’t misunderstand me. Prem:No need to give any explanation Soumya.I know everything about you and Rudra. Rudra and Soumya were dull. Prem:I have no issues with it. Rudra and Soumya were stunned. Rudra whispered:Prem has no problem with his fiancee’s affair?Are Indians more broad minded than western people? Prem:Actually even I love someone. Prem told them everything about Simar. Rudra and Soumya were shocked.Shivay had called all Oberois there.They reached there only to hear this shocking revelation from Prem. All were relieved.They became happy. Harish:We all had noticed how sad you were during all functions.Don’t spoil your life by sacrificing your love. Shivay:That’s what I told Prem.Be like our Rudy who is not willing to let his love go easily. Avantika:If you don’t marry the person you love your marriage will be in a hell. Gopi:If you marry the person you love marriage will be made in heaven. Ahem:If you sacrifice your love now for your father’s friendship when the truth comes out all of them will break down. Prem:You all are right.I should not suppress my love for Simar.It will burst out one day in a bad manner. Anika:Then go confess love to your beloved Simar. 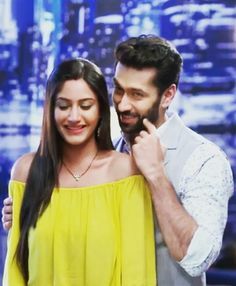 Shivay held Anika closer:And be happy in love like us. Prem looked at Rudra and Soumya. Prem:You both should also unite.Don’t worry.After meeting Simar I will tell my parents about whom I love and I can’t marry you.That time Tej uncle will not hesitate to accept Rudra for Soumya. Rudra and Soumya smiled:Thank you so much Prem. Prem:I have to thank all of you for making me realize what a big blunder I was going to do. Shivay and Anika looked at Rudra and Soumya:Cheer up guys.You guys are going to get married soon. Rudra jumped with joy and Soumya giggled.They all hugged Rudra and Soumya. Harish and Avantika were eating and chatting in their room. Harish:Usually you tease me for eating food.But nw you are also giving me a cmpany. Rudy will get all the happiness he deserves easily without hurting anyone. Harish:Even I am very happy.You see..everything will happen as we wish. Avantika smiled:I just want everyone’s peace and happiness.Now I am relieved that even Prem won’t be hurt in the process. Harish:You are right Avantu.I too feel relaxed now. Simar opened the door hearing the calling bell.She was surprised to see Prem there. Simar:Why did you come here now?I am just a friend for you.Right? Prem:That was a lie.Sorry for telling that lie. Simar stared at him:Prem…what are you saying? Prem:Not just Prem…your Prem.I am only your Prem Simar. Prem:I love you a lot and I have realized that I can only marry you.I realized that my love for you is not to be sacrificed for anyone.It can only cause pain. Simar was very happy:Prem..I am so happy. Suddenly her face became dull. Prem:I can’t marry Soumya.She too loves someone else.And I will take you home to meet my parents.I will show you to them and tell them that you will be my bride. He knelt down before her and asked her:Simar…will you marry me? She smiled holding his hand:What is the need of asking me that?How long have I been waiting for you to propose me like this?I too want to marry you Prem. They both smiled and had a sweet embrace. Rudra and Soumya were chatting together.